The tulsi forgive me to present in so few lines all its properties! Let's talk first of all its features against chronic stress causing a state of what I call "mental fog". Under constant assault of adrenaline and cortisol, glucose bringuebalé by yoyos that follow, the brain more clearly works. He "multitasking" of a messy and unpredictable ways. The holy basil, taken in infusion of fresh plant every day for several weeks, has an adaptogenic action. It calms the pituitary-adrenal axis and hypothalamus-regulates cortisol. Moreover, holy basil is an excellent background plants against allergic rhinitis. You will begin to drink the infusion 2-3 weeks before the arrival of pollen. 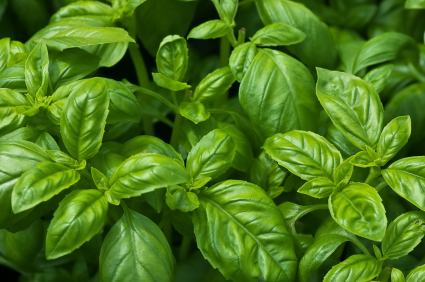 As the culinary basil, it is a remarkable plant for the regulation of blood sugar. Studies confirm that property, whether one is fasting or you are coming to eat. It restores our cells improved insulin sensitivity. I would strongly recommend a small concentrated infusion soon after meals. Moreover, the tulsi also reduces fermentation and calm intestinal cramps. The infusion is well accepted by children. I will not dwell on the seed because it must proceed in the same way as the culinary basil, that is to say in the spring when the risk of frost are discarded. Barely cover the ground seeds. Pack it well and keep moist until germination. For the rest all depends if you have sown seeds annual holy basil (Ocimum sanctum) or perennial basil seeds (O. gratissimum). The annual germinates very easily and produced a large quantity of leaves and flowers. He is stocky, compact shape and requires some space to grow well. Do not let one plant per pot. For the ground, space your plants 30 cm. It produces a large amount of flowers and reseed themselves abundantly. The perennial seed less easily. It produces fewer leaves and are less tender. It gains height, but is narrower and rangy. Keep three plants per pot or in the ground grow tight. It is somewhat less aromatic, slightly more bitter. However, it has a significant advantage: it remains available twelve months a year. Both species are not very demanding in water. However, keep them in full sun in a normal land that drains well. Be careful not to let the moisture. Beware also of caterpillars and aphids. If you want to look for perennial basil next year, be sure to return it during the coldest months of winter. And keep it in front of a sunny window. The taste of plants tells us a lot about their properties. Here's what the two cousins ​​is Ocimum sanctum and Ocimum gratissimum. The holy basil is more aromatic, more spicy, slightly peppery. A bit like a spice, it is more energy, promoting better peripheral circulation with a slight thinning effect on the blood. In hot infusion, it will have a warming effect in the person who often cold extremities. The perennial basil is more bitter and spicy. In addition to its adaptogenic effects, it acts as a mild tonic gastric secretions and smooth muscle, absolutely indicated for the person suffering from atonic digestion. It is also slightly challenging and liver protector.